HomeGrown Bees: More Free Bees! On Saturday I got a call from a neighbor who was having some tree trimming done. 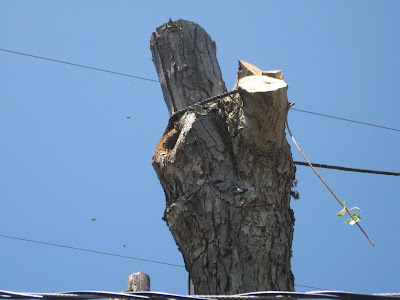 Seems midway through one cut the guy sliced into a hive, and bailed out of the tree post-haste (leaving his chainsaw imbedded in the tree). Actually, I guess it doesn't. Trust me, this was Paul Bunyon territory. The hive entrance is that huge knot on the left. Anyway, when I cut it through the damn thing swung around like a battering ram. I ducked close to the ladder so it missed my head, but it gave me a good whack on the shoulder. Didn't knock me off the ladder, fortunately. So we lowered it to the ground, I stapled hardware cloth over the openings, and three of us lifted it into my truck. When I got home I just rolled into an empty field next door and pushed the thing out. 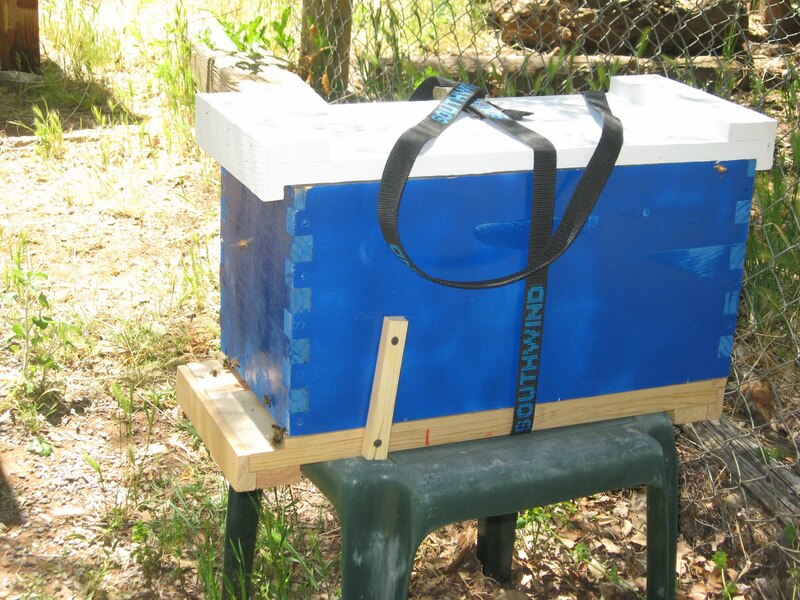 I pulled the hardware cloth off the openings, and when I last checked the hive is doing fine in their newly mobile home. I grabbed a cardboard box and put it under the cluster, and then used a drywall knife to scrape along the ceiling, the idea being to dislodge the cluster. Only it turns out this wasn't a swarm, but a new hive with three or four combs started! I sliced right through the comb, dropping the entire mess into the box. With no other idea, I simply poured the whole thing, comb and all, into a nuc, and added some frames. I repeated the process several times to continue to remove clustering bees, but I could tell from the fanning activity at the nuc that I'd captured the queen on the first try. I told them it was not something I wanted to deal with. 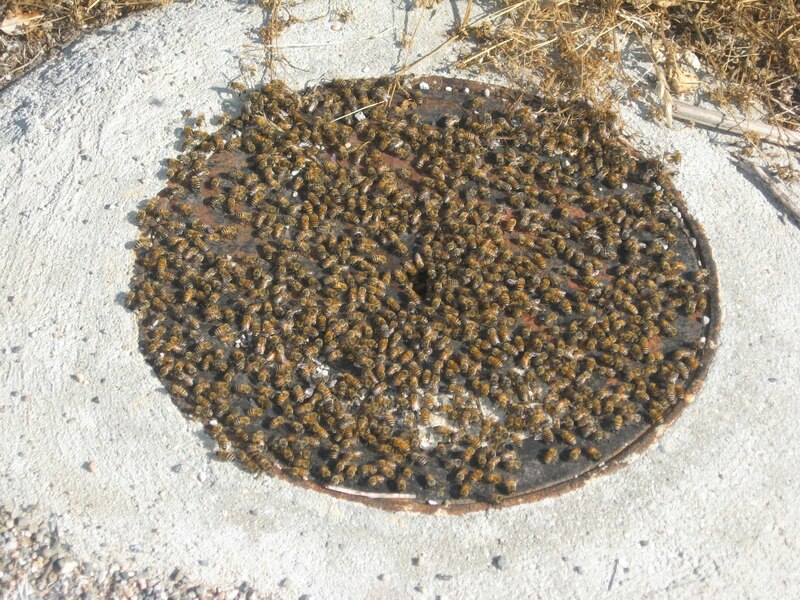 for one thing, ground-based hives have a better chance of being Africanized, making them more aggressive. For another, I would have needed a city employee to open the manhole cover, and I would have had to bring a generator to power the bee-vac in order to get all the bees. I also turned down a call to get two hives out of a guy's attic. 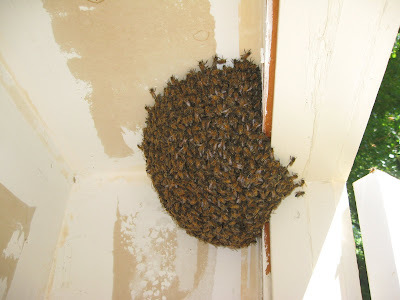 The idea of laying on my stomach in a hot attic in my beesuit with the (loud) bee-vac going for an hour next to my head was just not very appealing. But I keep getting one or two calls a day, mostly due to the flier I gave the Ventura County Fire Dept. 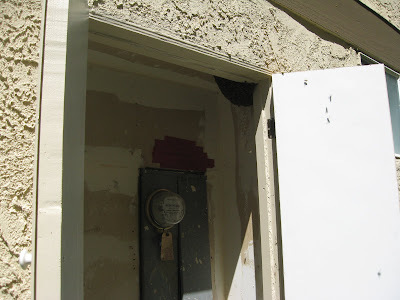 Tomorrow afternoon I go to Simi Valley again, this time to pick up a wine barrel with a hive inside. The homeowner said I could take the barrel, so this'll be an easy one. sounds like you are going to have to have a few out apiaries at the end of this season! Congrats on getting so many swarm calls. I have had one and it happened when I was out of town for 3 days when they called my cell. Yes, in fact I just relocated 4 hives to another ranch! Been getting at least a call a day for the past week or so; sometimes the swarm already took off before I could get there, but I got four in the past week! Next post will have pix and details. If you're checking out this blog, presumably you're thinking about becoming a hobbyist beekeeper, or you already are one. Either way, good for you! Beekeeping is a rewarding and fun hobby, and it's also a great way to really get in touch with the natural world around you--- even if your "natural world" is a suburb or downtown apartment! As often as possible it's my intention to show rather than tell, so if you take some time to go through the archives you'll find lots of videos that cover everything from the basics of lighting your bee smoker to treating for harmful mites to harvesting honey and more. I'll continue to add to these videos with each season. For an easy way to see all the how-to videos, go HERE. If you want to comment to me directly, or you need to reach me to come grab a swarm or remove a hive, you can email kerrykcox@yahoo.com.